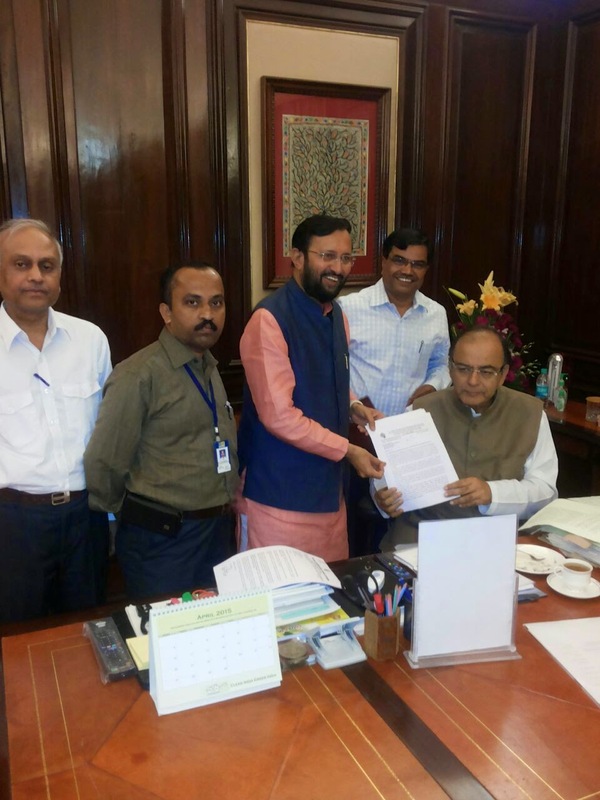 A NOINO delegation led by its President & Union Minister Shri Prakash Javadekar met Union Finance Minister Shri Arun Jaitley today i.e. 13th April 2015. Shri Javadekar was accompanied by NOINO’s General Secretary Shri Dattaraj Prabhukhanolkar and senior leader Dr S.B.Sharan. The delegation submitted a memorandum pointing out the inordinate delay in settlement of wage revision and requested for early settlement. The delegation insisted that the wage revision in LIC should be according to the paying capacity of the Corporation. The delegation also submitted a separate memorandum demanding one more option for pension. NOINO strongly insisted that this option be given separate from wage revision. Shri Jaitley was positive in his responses on both issues and assured to look into these. The NOINO President also discussed with the Finance Minister other miscellaneous issues related to the industry. NOINO will continue its efforts till the legitimate demands of employees are met.